“Here’s the chance to virtually undo the visible evidence of sun damage, dark patches, age spots, even acne scarring. Gently. For all ethnicities”. 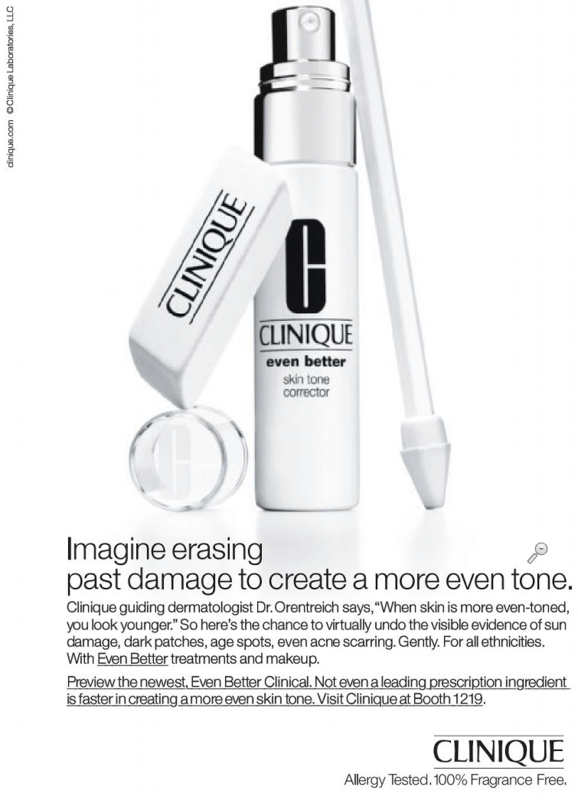 So says the promotional material for Clinique’s Even Better Tone Corrector and makeup. “Not even a leading prescription ingredient is faster in creating a more even skin tone”. Sounds too good to be true. Also sounds like it might be risky for rosacea sufferers. Anything that effective is surely going to be too harsh for rosacea sufferers right ? Time will tell whether this latest release from Clinique will join the Redness Solutions in the cosmetic counter’s rosacea collection. Here is the advertisement that appeared in the proceedings from the recent AAD meeting in Florida. Even though this product was introduced in 2008 it is noteworthy that Clinique are now currently promoting it directly to physicians. Clinique does not publish the ingredients for this product but you can request the listing from them. According to Spot of bother, published in The Times Online in January 2008, one of the key ingredients in Clinique’s new Even Better Skin Tone Corrector is ascorbyl glucoside. water/aqua/eau, dimethicone, isododecane, cyclopentasiloxane, polysilicone-11, butylene glycol, yeast extract/faex/extrait de levure, ascorbyl glucoside, hordeum vulgare (barley) extract/extrait d’orge, betula alba (birch) bark extract, cucumis sativus (cucumber) fruit extract, scutellaria baicalensis root extract, morus bombycis (mulberry) root extract, trametes versicolor extract, helianthus annuus (sunflower) seedcake, saccharomyces lysate extract, curcuma longa (turmeric) root extract, oryza sativa (rice) bran extract, citrus grandis (grapefruit) peel extract, triticum vulgare (wheat) germ extract, peg-6, peg-10 dimethicone, cholesterol, salicylic acid, polysorbate 20, isohexadecane, propylene glycol dicaprate, caffeine, sodium rna, acetyl glucosamine, simethicone, tromethamine, caprylyl glycol, glycyrrhetinic acid, polysorbate 80, di-c12-18 alkyl dimonium chloride, sodium hyaluronate, tocopheryl acetate, squalane, sodium sulfite, sodium metabisulfite, hexylene glycol, ammonium acryloyldimethyltaurate/vp copolymer, acrylamide/sodium acryloyldimethyltaurate copolymer, sodium salicylate, disodium edta, phenoxyethanol, yellow 5 (ci 19140), yellow 6 (ci 15985). Like many Clinique products, it is hard to glean much real information from such a detailed and lengthy list! According to Clinique’s own web site, 290 of 367 (79%) customers would recommend this product to a friend. bought it, tried it, tossed it. too harsh. This product is designed for hyperpigmentation,not rosacea. To harsh for my sensitive skin, triggered my roseacea. I spent thousands, which I didn’t have, at the dermatologist…to no avail with my melasma. Lots of peeling and that just revealed even darker skin underneath. Went to the Clinique counter after reading an article on Clinique’s Even Better products. Tested it, bought the $52 trial size kit, plus the foundation and brush applicator. It’s been 5 days and I already see such an improvement! I can already go without any makeup where the melanoma was!!! Well…except SPF moisturizer and some translucent powder to make sure I don’t shine. Love it!!!!! I noticed that someone has said it made their rosacea flare up. Certain ingredients like grapefruit extract can possible react on the skin if one is taking certain medications. Otherwise, the ingredients appear very good. For instance scutellaria and cucumber would possibly be good for inflammation. Birch bark is an awesome ingredient in my book as it softens and smooths hair and skin. Caffeine literally wakes up my skin. Many of the other ingredients have antiseptic and antibacterial properties. I am not a doctor these are my opinions, however, I am schooled in herbals many of which are used in Clinque products. If someone has a problem with Clinque, it may be an allergy (items on the ingredients list look hypo allergenic as far as I know) or may have an interaction with an ingredient due to the use of certain medications. Also, unless one has a very bad reaction to a product, it is a good idea to give it at leat 6 to 8 weeks to see optimum results in my experience. I have been using it for 2 weeks and the redness caused by my rosacea is actually starting to become less intense. I currently use metrogel at night to keep flare-ups at bay but it does nothing for the redness. I am pleasantly surprised that the redness is less apparent since I have started “even better”. I purchased it to fade some brown spots that appeared after a sun burn last summer and it is doing wonders on those as well. yay! I have had rosacea for 25 years. Been through all the antibiotics and the prescription lotions. I got this as a sample with a gift for purchase last Novemebr. I tried it on a small section at first because I am so sensitive. My rosacea is 98% gone after using this product for five months. Dramatic improvement in the first week. I use the Even Better cleanser now. I don’t know why it works on me. If I ever heard that they were discontinuing the product, I would buy as much as a could and try to figure a way to preserve it. I should add to my previous comment that I use the Even Better Moisturizer that came out in 2011. I have not tried to the serum and see no need to because I have experienced such dramatic improvement with the Even Better Moisturizer. I may try their foundation next. I was not a Clinique customer. I worship them now. I can do a cardio sessions without looking like a tomato when I heat up.